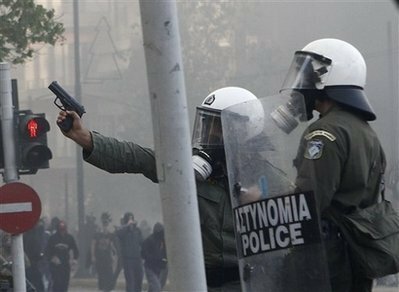 Eyewitness updates on the unrest in Greece on the day of the general strike. ATHENS: High School students joined the trade union march. They pelted riot police with stones and paint. In the suburb of Kaisariani the school students attacked the local police station. Meanwhile, a group of anarchists attacked the central courts while inside Alexandros’ murderer was appearing before the prosecutor. The court’s control room and a media van were set on fire. PATRAS: General assembly now at the university about yesterday’s events. UPDATE 13:35 TV footage already shows 12-year old students pelting the riot police with stones this morning; fresh rioting has erupted at the Propylea of the university of Athens; riot police threw tear gas at people sitting in cafeterias &those people attacked them in response. The stalinist trade union (PAME) has already retreated and left the street. Now is our time! Today is the day. Yesterday’s events showed that the Greek state will try to end the rebellion as soon as possible. The fascists are now out on the streets; mainstream media carry fresh reports this morning that the government has decided to declare a state of emergency tomorrow (Thursday), should the rioting not end by then. Reports on indymedia claim that the ballistic report of Alexandros’ death has been altered to claim show the cop’s bullet bounced off before killing Alexandros (should this happen, his killer cop will avoid conviction). These are all rumours, but now seem increasingly likely to happen. What will happen today is extremely important and will define what happens from now on. I’m heading for the street, next short reports will come in from there. 3:11am, Patras: This is what a junta looks like! …faced with a dark, dark image from the past. Fascists working with cops run amok in Patras; they stab two in Athens; police shoot 15 times in the air in Palaio Faliro and a flaming car is driven against the police station of Zefyri, Athens. These are what I consider to be the most important events of the day; there’s so many others (more attacks at police stations; tens of demonstrators arrested in cities across the country etc) – but it’s simply impossible to summarise everything here. The most important events of the day are those of Patras. Please read the separate post and spread the news. …and here’s a summary of today’s events in Athens. The day started with the funeral of Alexandros at the cemetery of the southern neighbourhood of Palaio Faliro. There was a mass turnout at the funeral, including many anarchists, high school students and local youth. The small group that took the neighbourhood’s streets after the funeral comprised mostly of these – simply kids from the neighbourhood angered at Alexandros’ death. What the image above shows is a policeman of the “Z-force” (Omada Zita, the police’s motorcyclist unit) who shot a total of 15 shots in the air. This is a few hundred meters from where Alexandros’ funeral took place a few hours earlier. Perhaps, the feeling of comfort and familiarity I felt after meeting up with good old friends made the feeling of unfamiliarity even starker once I stepped onto the streets this evening. This was a weird feeling, and one I have never felt before in Athens – a feeling that you had to have a clear reason to be on the streets: For the uprising or against it – but definitely one of the two. Like being in a remotely located demonstration, where you are either a demonstrator or the police; except this is in the heart of a bustling metropolis and all there is, it seems to be, is people angrily reacting to the death of Alexandros on the one side, and those who caused his death on the other. To get around Eksarhia these days you need to master the skill of zig-zaging around streets and blocks, to avoid riot police units, the hoards of undercover police and of course, the fascists. My poor zig-zaging skills nevertheless brought me to the grounds of the NTUA, where a good 2,000 people quite clearly would show who it is we are fighting with. An absolutely crazy mix of groups of punks, migrants, junkies and anarchists lined up across Patision Ave outside the Polytechnic; dancing, drinking and waiting for the riot police to come. Reports started coming in that fascist groups had started making their appearance in the area and around Victoria Square in particular. One male (a migrant, his ethnicity is not being reported) and one woman have been stabbed tonight. This was after we had heard about the incredible course of events in Patras. Combining the two, it becomes quite clear: The “official” Greek state has reached its limit in dealing with the revolts. Monday’s riots were simply out of the police’s capacity for control. This is the time for its informal forces to kick in: the fascists. Their perfectly coordinated attacks in Patras clearly shows this. This is not a time to panic, of course – we have so many new allies on our side that if we play this properly the fascists won’t dare strike again. The attack against the police station of Zefyri shows this: Zefyri, in the outskirts of the city, is one of the most deprived (if not the most deprived) neighbourhoods of Athens, with a large Roma majority population. At about 10pm tonight, a crowd of around six hundred besieged the police station, attacking it with molotov cocktails while a flaming car was driven toward the building (though stopped by guards before reaching it). I guess it is quite evident from the above that this is an extremely tense situation and everyone feels that we are reaching a make or break point. Tomorrow’s general strike is absolutely crucial. People have to fight four days of tiredness; the sold-out trade unions that have turned the demonstration in a static gathering (to prevent mobility of the crowd and make it easier to control); the police running amok – and now the fascists too. Things are going to be far from easy, but there is no other way to get rid of those images from the past.